Rainey is looking for her forever home. This sweet gray and white kitten was found alone in the rain and so she was named Rainey. Rainey is an intelligent, talkative kitty who will enjoy hanging out with you. She is now living in foster care with four siblings (Fortunato, Lenore, Roderick and Rowena). Her foster family has four cats, two large female dogs, and two daughters (ages 8 and 10). Rainey enjoys being around other cats as well as dogs and people, but she is also independent and like to do things by herself. Rainey has a chirpy meow! One of the cutest things about her is her voice: She has a happy, chirpy meow that sort of sounds like the noise a bird would make. If you chirp back at her, she will perk up and have a conversation with you! 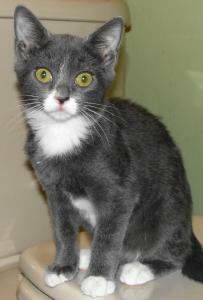 See more pictures of Rainey at Petfinder. Plus, you can also sponsor Rainey. Awwwwwwwwwwwwww!! Rainy is very cute !!! 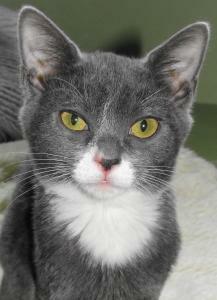 WE purr very hard that she will find a loving home where she can chirp forever!!!! she is absolutely adorable!! I just tweeted her. I so hope she finds a furever home! Sweet cat. We will purray she gets a forever home fast! Rainy is very appealing. We hope she finds her perfect pawrent soon.